Cleaning is an important part of your pool maintenance. Besides your pool filter and pool pump, it will require manual cleaning and the right maintenance to keep the water enjoyable and safe to swim in. Today’s technology offers robotic pool cleaners and even automatic pool cleaners. While they have their benefits, it is vital to have the best pool pole to remove floating items and dirt your auto cleaners cannot take out. Still not sure which pole is best for your pool? Read on as we review the top 5 models on the market today. Here is a review of the top 5 pool poles on the market today. This pool pole boasts of 2 piece construction that makes it a durable product. Made to reach the furthest part of your pool, the pole extends from 8 ft. to 16 ft. with ease. Both the inner and outer parts of the pole are made of commercial grade material and have a thickness of 1.24mm. Another great feature of this unit is the smooth finish that features deluxe large external cam. Very affordable, the pole won’t cost you much and it is a long-lasting unit. It pairs well with JED 40-386, JED 70-262, JED 70-272, and JED 40-365. As the name suggests, this pole has three pieces of dual exterior locking cams. Thanks to this featuring, cleaning your pool is made fast and easy to ensure you use the minimal time when cleaning your facility. The pieces feature a 5 ft. to 15 ft. adjustable length to make sure it’s both perfect for small and large pools. Also, there is a magnetic piece at the end of the unit that helps to collect screws and nails that might have fallen into your pool. The pole can easily fit all standard attachments including skimmers, nets, vacuum head, and others and comes it a blue color. 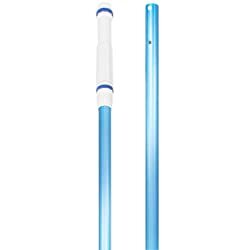 Just like the best poles out there, this pole’s length adjusts easily to reach 16 ft. And it is ideal for use with the majority of spa and standard pool maintenance tools since it is a universal product. Another feature of this unit is the black anodized aluminum material, which is of commercial-grade. Furthermore, the pole comes in a 1mm thickness that is hard to break. It also has a smooth finish that ensures it remains rust-free for long. You will also be excited to learn that this pole has a superb external-locking cam that keeps it in place when collecting debris and dirt from your pool. The Swimline HydroTools has a blue anodized body as well as an external locking cam. It is easy to adjust its length from 8 ft. to 15 ft. to ensure that it reaches all the corners of your pool. Furthermore, this pole is lightweight and easily attaches to rakes, pool skimmers, and brushers. And it is made of an aluminum material that makes it corrosion-free if left in water for a long time. With this pole, you can rest assured of getting a clean pool. It even supports the weight of the wet material. It is a great unit that you should consider to have. 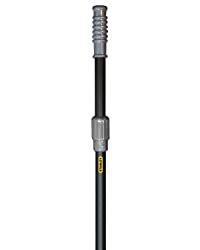 This pole easily adjusts from 8 ft. to 16 ft. and attaches to pool rakes, vacuums, brushes, and skimmers. It is a two piece pole that comes with external locking cam to ensure that it remains sturdy when collecting leaves. Another notable feature of this unit is the ribbed design that adds to its strength and ensures that it will last longer. It doesn’t bend easily and comes with a one year warranty. With this unit, you will surely get value for your money. Brand/Manufacturer – There are a lot of brands out there – some are better than others. Choose a pole from a reputable manufacturer to ensure that you get a quality product. Mode of cleaning – Both the bottom and the surface of your pool need cleaning. There are poles that are made for cleaning the bottom only while others clean the surface only. Choose a product that will handle both the bottom and the surface of your pool. Price – Always have a budget before you hit the market to get any pool product. The cheapest models might last if you avoid using them heavily. Of important, the best pole is the one that with bring worth to your money. Features – First, your pole should provide an adjustable length. Then, watch out for locking cam or mechanism. Also, ensure that it can attach to other accessories you use to when cleaning your pool. Durability – Don’t go for a product made of plastic material. The best poles are made of aluminum. Hence, check for this material to ensure that you will get a durable product. Q: Should a pool pole come with a warranty? A: Never trust a product without a warranty. Ensure that you get a pole that comes with at least one year warranty so that you can get it repaired by the manufacturer if it comes with any defect. Q: What are the benefits of a pool pole? A: Poles help to keep your pool clean by removing stones, leaves, dirt, and other material. You can even change the length of your pole to collect fine dirt in your pool. We hope that after reading the best pool pole reviews and buying guide you can now make up your mind on what to buy. Choose the best model for your pool and keep it clean.